The Motor-ship Zealandic, built by the firm of Swan & Hunter for the Shaw, Savill & Albion Line, is the largest and fastest New Zealand trader. The vessel will cover the journey in 34 days. The refridgeration plant contains 35 miles of pipes. The motor merchant ship Zealandic was launched from the Swan Hunter & Wigham Richardson, Newcastle yard on November 25th 1927 and completed during March 1928 for the Shaw, Savill & Albion Co Ltd, London. The Zealandic's homeport was Southampton. It was one of a series of four large refrigerated motor ships built for Shaw Savill & Albion to carry mixed frozen meat and general cargo. The Brisbane Courier, November 16th 1928 wrires: On board the Aberdeen and Commonwealth Liner Zealandic yesterday, Commander J. H. Gaskell, RD., R.N.R., and Mr. J. A. Robertson, Brisbane, agent for the line, entertained a small company of shipping and mercantile men and representatives of the Brisbane papers to luncheon. Commander Gaskell, in welcoming the visitors, said the Zealandic was really the last word in cargo ships. She had accommodation for 137,000 carcases of mutton or the equivalent in beef, besides ample space for wool and general cargo. Mr. J. A. Robertson added a welcome to those present, and said that the first two of the latest built motor ships in the world had arrived in Brisbane recently, the Zealandic and the Coptic. Both of these vessels were Aberdeen and Commonwealth liners. These vessels are two of four of the same type, the others being the Taranaki and Karamea, and they will assist as required with the Bay and Dale ships of the late Australian Commonwealth Line, in maintaining the fortnightly service, which the Aberdeen and Commonwealth Line has now instituted from the United Kingdom and Continental ports to Australia. The Zealandic was built by Messrs. Swan, Hunter, Wigham, and Richardson, Newcastle-on-Tyne. She left the builders' yards on March 30th 1928 on her maiden voyage, and proceeded to New Zealand via Panama in ballast, her steaming time covering a period of 35 days. The Zealandic and her sister ships are the highest powered cargo motor vessels afloat. As is customary with a new motor ship, the Coptic being on her first voyage will not be run at her maximum speed, but nevertheless is expected to make the journey from Melbourne to Dunkirk in 32 days. The Zealandic, however, having completed her maiden voyage, made the trip from London to Australia at the fast speed of approximately 15 knots, and it is anticipated that all these vessels will be able to maintain this speed at sea fully laden. The Zealandic has six holds, all of which, with the exception of No. 6, are insulated, which, together with other spacious decks will be utilised for general cargo. She has 404,000 cubic feet of refrigerated space for the carriage of meat, etc. For the carriage of fruit and cheese in the 'tween decks, five Sirocco fans are fitted to circulate the cooled air through these spaces. Electrical auxiliaries are utilised throughout the ship, and in all 20 electric winches are provided to deal with the six hatches, which vary in size from 16 feet 6 inches square up to 27 feet 6 inches by 16 feet 6 inches. The Zealandic is splendidly equipped with cargo gear, everything being arranged to handle cargo in a most efficient and expeditious manner. The windlass is electrically operated, and the steering-gear worked by electro-hydraulic power. 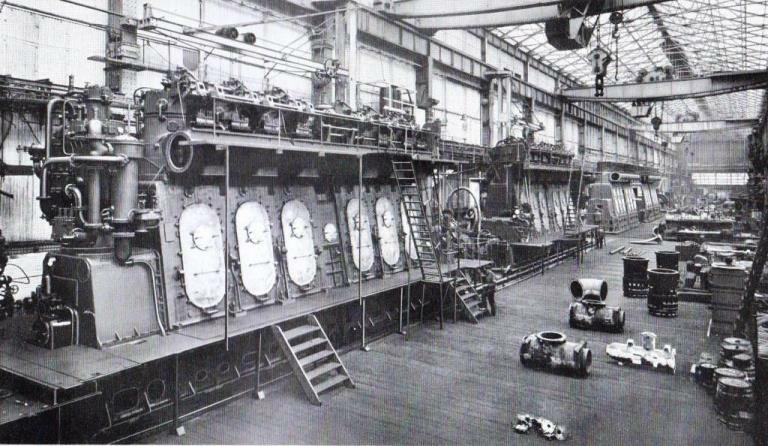 The propelling machinery was built by the Wallsend Slipway and Engineering Co., and consists of two Wallsend Sulzer single-acting two-stroke type, each designed to develop 3,725 b.h.p. These engines are the largest of the Sulzer type constructed in Great Britain for installation in ships. For the supply of the large amount of electric power needed in this ship, four Mirrlees Bickerton and Day four-cycle single-acting Diesel engines, each 400 b.h.p., running at 300 r.p.m. coupled to Sunderland forge dynamos of 278 k.w., are installed. The Zealandic has four state rooms for passengers, and a dining-room and smoke room are provided at the forward end of the bridge deck. So far as the crew is concerned, the vessel is very comfortably equipped, and the accommodation throughout is heated bv means of electro-vapour radiators. She will leave Brisbane on November 17th for Sydney, thence to Melbourne, leaving that port on November 28th, and will complete the voyage from Melbourne to Dunkirk in 32 days, or probably less. May 7th 1932 MV Zealandic recorded as travelling from New Zealand to London, embarking at Bluff and Auckland. May 17th 1933 MV Zealandic recorded as travelling from Brisbane to Hull, embarking at Sydney. Early in November 1934 the Zealandic arrived at Fremantle having made the journey from London, via Suez in the excellent time of 29.5 days, at an average speed of 15 knots. From Fremantle the vessel reached Brisbane on November 7th 1934 before moving on to Gladstone & Townsville. It would return to Brisbane by November 15th before starting its long journey to London and ports. A fire broke out in the engineroom of the Shaw Savill motorship Zealandic (8,443 tons) at No.6 wharf, Victoria Dock, early today, when a boiler blew back and ignited a sump of oil. Firemen got the outbreak under control after an hour's fight. Until a more thorough inspection is made tomorrow it will not be known whether the ship will have to enter drydock. A protracted delay would mean a revision of the ship's present schedule to return to London via Sydney, Brisbane, Cairns and the Panama Canal. Members of the Zealandic's crew fought the blaze at first with fire extinguishers, but eventually were driven up on deck by the acrid fumes. The fire brigade was called and let down two hoses through a ventilator to the engineroom. Water and chemical extinguisher mixture were poured on the flames. Another squad of firemen went to the bows of the Zealandic and struggled through the smoke along an escape tunnel to the engineroom. The flames were brought under control when firemen equipped with smoke-proof helmets were lowered through the engineroom hatchways by lifelines. Damage to the Shaw, Savill & Albion freighter Zealandic, which caught fire in Victoria Dock early on Tuesday morning, has been assessed by a Melbourne firm of marine engineers at several thousand pounds. The contract to repair the damage has been given to Messrs. Peacock & Smith, marine engineers. It is expected that much repair work will have to be done. Rewiring of electrical cables alone is expected to cost several hundred pounds. To enable work to proceed on pumps sea injections will have to be sealed by a diver, who will begin work on Monday week. The engineers believe that the work will take at least a month. Shortly after the start of World War II the Zealandic was noted at Southend on October 23rd 1939 before commencing, independently, a journey via Cape Town for Australia. Cape Town was reached on November 11th 1939, then Fremantle (Nov 27th/28th), Adelaide (Dec 2nd), Melbourne (Dec 4th/5th), Sydney (Dec 8th/10th), Brisbane (Dec 11th/12th), Rockhampton (Dec 13th/15th), and Gladstone (Dec 16th). From Gladstone the Zealandic reversed its course and made a short coastal trip to Newcastle before returning to Brisbane (Dec 23rd) before commencing its long return voyage to Liverpool, visiting Sydney (Dec 25th/31st), Melbourne (Jan 1st/5th, 1940), Albany (Jan 9th/10th), Capetown (Jan 26th/27th) and Freetown (Feb 5th/6th). At Freetown the Zealandic joined convoy SL.19F, arriving Liverpool on February 20th 1940. Departing Liverpool independently on March 15th 1940, the Zealandoc headed for New Zealand via Panama, visiting Curacao (Mar 27th/28th), Cristobal (Mar 30th), Balboa (Mar 31st), Oamaru (Apr 20th/30th) and arriving Lyttelton on May 1st 1940. Departing Lyttelton on May 13th 1940 the Zealandic sailed for the United Kingdom via Panama, visiting Balboa (Jun 2nd), Cristobal (Jun 3rd), Curacao (Jun 5th), Bermuda (Jun 10th/12th), then joining convoys BHX.50 & HX.50 (Halifax - Liverpool) to Weymouth Bay (Jun 27th/28th), then independent to Southend arriving June 29th 1940. After three weeks at Southend the Zealandic departed July 20th 1940 as part of convoy FN.227 for Methil (Jul 22nd/26th), followed by the Zealandic's last visit to Australia, travelling via Capetown (Aug 20th/21st), Fremantle (Sep 5th), Adelaide (Sep 10th), Melbourne (Sep 12th/14th) and Sydney (Sep 16th/24th). From Sydney the Zealandic headed for the Panama Canal and Liverpool, visiting Brisbane (Sep 26th/27th), Timaru (Oct 3rd), Wellington (Oct 15th), Balboa (Nov 4th), Cristobal (Nov 5th), Curacao (Nov 8th), Bermuda (Nov 13th/16th) and independent across the North Atlantic to the Clyde arriving November 27th. The Zealandic departed the Clyde on December 31st 1940, arriving Liverpool on January 1st 1941 and sailing from Liverpool on January 14th 1941 for Brisbane, Australia, via the Panama Canal carrying general cargo. The unescorted Zealandic was torpedoed by the U106 under the command of Jurgen Oesten shortly before 1am on the morning of January 17th, 1941. At this stage in the war those ships with a good turn of speed would frequently travel alone, with the more northerly route being taken to avoid active U boat areas further south. The ship was about 450 miles south of Iceland at position 58.28N/20.43W when the attack took place. The Zealandic was under the command of Master Frederick James Ogilvie with a crew of 65, two gunners and six passengers. The first torpedo struck at 00.45 hours underneath the forward mast, stopping the ship for a brief time at which time distress signals were sent out. The ship got under way again but was hit amidships by two more torpedoes fired at 00.59 and 01.27 hours. The ship sank slowly allowing the crew to take to three lifeboats. The Zealandic sank and the three lifeboats and their 73 occupants were never seen again, lost no doubt in the severe weather conditions that frequent this part of the North Atlantic during the winter months. Sister ships: Coptic, Taranaki & Karamea. The latter two ships were built by Fairfield Shipbuilding Eng. Co. Ltd. Glasgow and were slightly longer. All three of the sister ships survived the carnage of World War Two and remained in use until the 1960's when each made their way to a scrapyard. Publicity views of the engines for the Zealandic & Coptic under construction. 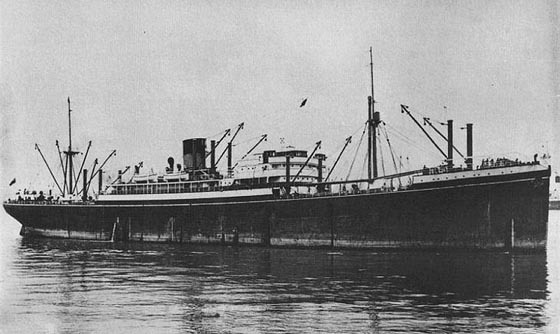 The Zealandic was featured in 'The Motor Ship' February & March 1928.